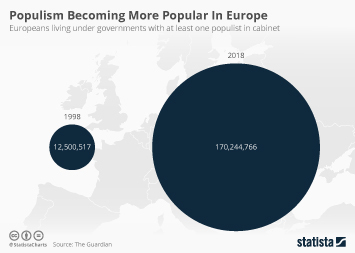 Two major events in 2016 continue to define the ongoing surge in populist movements that have overtaken many western countries in the mid-2010s. The first was the Brexit vote, where the United Kingdom voted to leave the European Union in June, followed by the election of Donald Trump in November as President of the United States. In the wake of these two anti-establishment victories the French nationalist Marine Le Pen challenged, but ultimately failed to win the French presidential elections of 2017. Despite this setback, populist parties have continued to wreak havoc on established political parties, with the French socialist party taking a particularly hard hit in the 2017 elections, where their share of the vote decreased by 22 percent. In Germany, the right-wing populist party Alternative für Deutschland (AfD) increased their voter share by 7.9 percent in the same year mainly at the expense of the CDU and SPD. More recently, two populist parties have taken power in Italy following the indecisive election that took place there in March 2018. It is unclear how big the impact of the current populist surge will be for the future of Europe. As of March 2018, populist parties have secured more than half the vote in only four countries in the European Union. The parties themselves are perceived negatively by large portions of the population along with many populist figures, such as Nigel Farage, Marine le Pen and Geert Wilders. There is also evidence of a generational divide, with younger voters more likely to have voted “remain” in the Brexit referendum, or to find figures such as Boris Johnson unpopular. The youth of Europe that are drawn to populist ideologies are more likely to be left-wing than right. With trust in institutions remaining low in some major European countries, populism’s appeal will likely continue for the foreseeable future. Whether or not they win more power or are able to achieve their goals once established remains to be seen.